An impacted tooth is one which has not come into the mouth by the time it would be expected to have. In other words it is stuck. The most common reason for a tooth to become impacted is lack of space. Other reasons may include cysts and tumors associated with the tooth, fusion of the tooth to the surrounding bone or nearby teeth, or in some instances for unknown reasons a tooth just fails to complete its movement into the mouth. 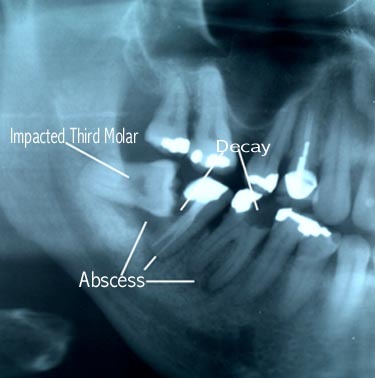 Which teeth become impacted and why? The tooth most likely to become impacted is the wisdom tooth, or third molar. These teeth are the third set of permanent (adult) molars. They are called wisdom teeth because they are supposed to enter the mouth by the "age of wisdom," roughly eighteen years of age. Hence why they are also know as the "eighteen year molars," in contrast to the first or six year molars and the second or twelve year molars. Wisdom teeth are not only the most likely teeth to be impacted, but also the most likely to be deformed, missing or present in extra numbers. Most people have four wisdom teeth: upper right and left and lower right and left. Some people are missing one or more wisdom teeth and others have extra sets (as many as quadruple, in my experience). Other commonly impacted teeth are the cuspids or "canines," also known as "fang" or "eye" teeth and premolars (the teeth just behind the cuspids). Often when people have extra teeth, these are often impacted. Any tooth can become impacted if it does not have enough room or if the timing of it development is out of synch with the rest of the teeth. Since many people do not have enough room for all of their teeth to come in, the one most likely to be stuck or impacted is the last one to form, the wisdom tooth. The other teeth had used up the available space as they came into the mouth. When a person has crowded teeth, the wisdom tooth may have even less space available after the rest of the teeth are straightened. Not all people have impacted wisdom teeth, some people do have enough room for their wisdom teeth. Many theories have been proposed to try to explain why so many people do not have enough room for all of their teeth, especially for the wisdom teeth. The most popular has been that our jaws have been getting smaller as humans have developed. However, studies done on ancient and modern skulls do not support this idea. What these studies do show is that in our ancestors, before modern dental care was available and to a lesser degree even today, the most commonly missing or decayed tooth is the first or six year molar. By the time that the wisdom tooth was ready to start to enter the mouth it might have had enough room in our very distant ancestors. Records of drafted and recruited US personnel during World War II showed that, with an average age of 19 years, that group was missing almost half of his or her teeth. The wisdom tooth is not the only tooth that may become impacted. Other teeth that are often impacted include the canine or eye teeth, the premolars or bicuspids (small molar like teeth behind the eyeteeth) and extra teeth. However, any tooth may become impacted if it does not enter the mouth on time or is in some way blocked. What, if anything needs to be done? Does anything need to be done for an impacted tooth? The answer depends on a few things. First, if there is enough room and the tooth is an important one for function or cosmetics, then if possible, an attempt is made to bring the tooth into position with a combination of surgery and orthodontics (braces). This is commonly done for impacted canine or eyeteeth. If the tooth does not have enough room, is an extra tooth or is deformed, often it needs to be removed. 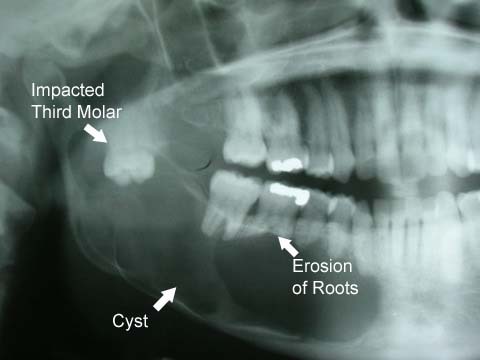 Large cyst associated with impacted third molar, displacing it and eroding roots of teeth. Sometimes the answer is nothing, for a while anyway. Nothing may happen for years. If the tooth persists on trying to come into the mouth it may push against the nearby teeth and damage them. If the gum opens up enough over an impacted tooth to allow bacteria from the mouth to enter the space around the impacted tooth, it may become infected. Depending on the type of bacteria, several problems may develop. An impacted tooth may cause difficulties with proper tooth cleaning and allow plaque (which is full of bacteria) to accumulate. This may lead with time to periodontal (gum) disease and spread to the nearby teeth. Other types of bacteria may cause tooth decay. The wisdom tooth or a nearby tooth may become decayed. Less commonly, the sack of tissue that surrounds the wisdom tooth may start to enlarge and fill up with fluid, forming what is called a cyst. A cyst may continue to grow and damage the jawbone, nearby teeth or other structures. This sack may also form tumors or growths. Although most of these are benign (and may still grow like the cysts) some may rarely be malignant (cancer). Delaying treatment may also place the nearby teeth at risk. Many patients come in to have a wisdom tooth, or other impacted tooth, removed because of pain, but many times a tooth adjacent to it is so badly damaged that it is the one that hurts or it may even be beyond repair and be lost. Sometimes a wisdom tooth may not cause problems until the person is much older, as old as the nineties in my experience. That is definitely not a good age to be having wisdom teeth removed. 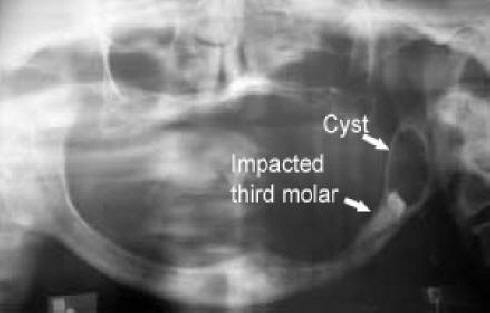 A large cyst associated with an impacted third molar in an older patient.Removing this tooth at this point in time is a much more difficult operation and carries higher risks of complications such as fracture of the jaw. Most of the problems with impacted teeth tend to develop with time. However, the best time to treat these teeth is before the problems develop. If a tooth has enough room and is to be brought into the mouth, there is a limited window of time to do this. As time passes, the tooth becomes harder and harder to move until it loses the ability to move. If a tooth does not have enough room, the best time to remove it is before it causes problems (infection, gum disease, decay, damage to other teeth, etc.) but before it finishes its development. In theory, an impacted tooth closer to the surface could be easier to remove. But, in reality, the structures that anchor a tooth in the jaw are the surrounding bone and the roots, not the gum that covers it. Many wisdom teeth at the surface have proven to be some very difficult teeth to remove. The more mature and harder the bone and the more developed and longer the roots, the harder the tooth becomes to remove. A common mistake is to wait for the tooth to come in more, hoping that it becomes easier to remove. The easiest time to remove a wisdom tooth is when the roots are about half to three quarters formed.